Correct pool operation relies on three main functions: Circulation, Filtration, and Sanitation/Water Chemistry. Below you will find an explanation of all three. Circulation of your pool is controlled by your pool pump. Having the right pump is very important. 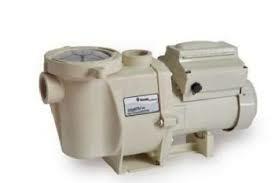 Preferably, a pump should circulate all the water in the pool once every eight hours. This is known as the turnover rate. If the pump is too small, there will not be enough flow to circulate all the water in your pool in a reasonable amount of time. If the pump is too large, it could cause damage to the plumbing and/or pool equipment. Consult your pool professional if you are concerned about your pump size. Sand Filter View Pic - Uses sand to filter small particles in the water. 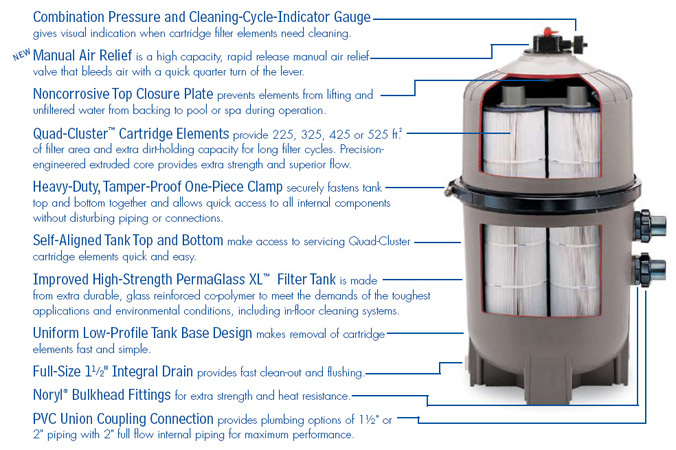 Sand filters have the least filtering ability of the three filters and is limited to about 20-40 microns. However, this is usually sufficient in most pools. 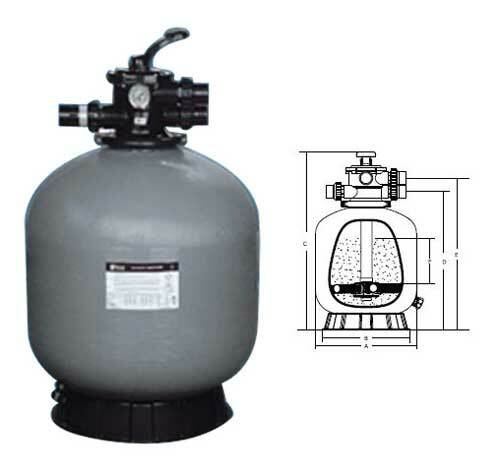 Advantages of sand filters are that they are very easy to clean and maintain. 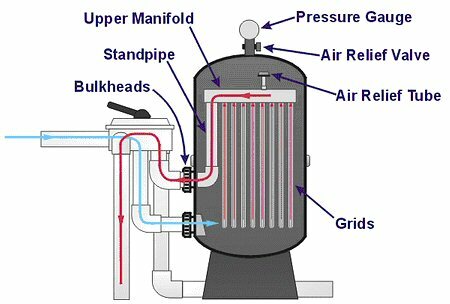 Cleaning the filter involves simply turning a valve on the top of the filter or side of the filter for side mount varieties. Cartridge Filter View Pic - Cartridge filters use pleated cylindrical cartridges to filter the water. 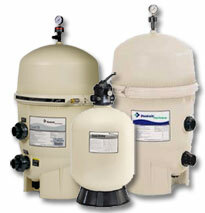 Cartridge filters can catch particles in the water to about 10-15 microns, which is slightly better than sand filters. However, a disadvantage of cartridge filters is that cleaning them requires disassembly of the filter. Diatomaceous Earth (DE) View Pic - DE filters have the best filtering ability of the three types, which is at about 2-5 microns. DE filters use grids packed with DE powder to filter the water in your pool. Like cartridge filters, cleaning the grids requires disassembly of the filter. PH - PH stands for potential of hydrogen. It is a measure of how acidic or basic a substance is. It is measured on a scale of 0 to 14. The PH should be kept between 7.2 and 7.8 in swimming pools. Alkalinity - Alkalinity is a measure of the amount of alkaline minerals in the water. It acts as a buffer for the PH and helps prevent rapid PH swings. The alkalinity should be kept between 80 to 120 ppm. Slightly lower or higher alkalinity than the recommended range is usally ok if the PH is staying in range consistently. Chlorine - Chlorine is the chemical used to sanitize the water, freeing it from algae, bacteria, and other pathogens. Normal range for chlorine is 1 to 3 ppm. However, when shocking the pool, the chlorine can be raised as high as 20 to 30 ppm. Swimmers should wait until the chlorine level drops before entering the water. Entering the water when the chlorine is higher than 5 ppm can be risky and cause skin irration, burning of eyes, and respiratory problems. Cyanuric Acid (Conditioner/Stabilizer) - Cyanuric acid is used in outdoor swimming pools to protect chlorine from sunlight. Sunlight breaks down chlorine. By adding cyanuric acid to the pool, it helps prevent this from occurring. It is important to note that cyanuric acid also reduces the overall strength of the chlorine in the water. Cyanuric acid should be kept in the optimal range to prevent chlorine from becoming to weak to do its job. The ideal range is 30 to 80 ppm. Bromine - Bromine is another form of sanitizer similar to chlorine. It is used primarily in indoor pools and spas. While bromine is a better overall sanitizer than chlorine, it is not used in outdoor pools because there is no known way to protect it from sunlight exposure. Cyanuric acid has no effect on bromine. Calcium - Calcium is added to the pool to control how soft or hard the water is. Low amounts of calcium make the water soft while high amounts make the water hard. Calcium is important in swimming pools to protect the surfaces of the pool. Low calcium can cause deterioration of pool surfaces that can be seen as pitting and etching. Adding too much calcium is not good either, as it can cause scaling along the water line and water turbidity (cloudiness). The ideal range for calcium is 150 to 250 ppm. Phosphates - Phosphates in pool water can cause problems with algae growth. It is introduced into the pool from fertilizers, metal sequestrants, and organic matter such as leaves, seeds, and flowers. Keeping the phosphate level below 300 ppb (that's parts per billion) will greatly help in algae control. Salt (for salt water chlorine generators) - In pools with chlorine generators, salt is converted into chlorine through a process called electrolysis. 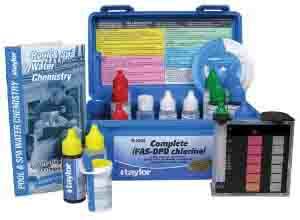 Keep the salt level between 2800 and 3500 ppm for optimal chlorine generation.